20% – We’re sure this is a number you’re familiar with when it comes to the cost of turnover. Ever since the well-known 2012 report came out putting the average cost of replacing a worker at 20% of that employee’s salary, it gets cited again and again. And it’s an important statistic. For companies with high turnover, a 20% replacement cost per employee can really take a hit out of your bottom line. Unfortunately, financial costs aren’t the only costs associated with turnover. This is especially true when it comes to a bad hire. There are hidden costs associated with the impact on manager time, decreased innovation and other consequences. We’ve outlined four quick facts about the costs of a bad hire and some advice on how to fix and prevent them. As we mentioned, the average cost of an employees is usually 20% of his or her salary, which tends to be $6,000 to $15,000. However, when evaluating the cost of a more experienced employee or someone with more specialized skills you can be looking at as much as four times salary. This includes everything from recruitment advertising fees, staff time, potential loss of customers, relocation and training costs for replacement hires, and more. If you’re seeing turnover due to bad hires, there’s a good chance there might be bigger problems at play. A bad fit has to do with more than just your interview process, but the selection process is a good place to start. You also should also evaluate engagement and the culture of your organization and make sure everything is in alignment. In a 2012 survey conducted by CareerBuilder, 43% of respondents reported they made a bad hire because they needed to fill a position quickly. This can happen for multiple reasons. The team may already be short-staffed, they may be trying to fill a position that requires unique expertise or they may be in the middle of a large project and need that missing manpower. When a hiring manager is under pressure to fill a position because of a time constraint, they are more likely to ignore the signs that the candidate may not be a good fit for the team. Hiring the way you always have, waiting for the “perfect fit” for the role and your organization can take weeks, even months. In today’s market, with jobseekers often interviewing with more than one employer, you can’t afford to delay; nor can you afford to rush. The alternative is to educate hiring managers on the consequences of a bad hire and employ behavioral interview techniques to dig deeper into a candidate’s performance and their ability to fit into the culture of your organization. A bad hire can be extremely detrimental to the team as a whole. When the person doesn’t fit the role, other employees notice. These employees begin to wonder and question the manager’s ability to judge fit within the team, and can lead to disengagement. And when that bad hire is still on the team, you risk losing even your best employees as they begin to look for employment elsewhere. Ensure that you’re evaluating the engagement and productivity of all your teams. Look for signs during onboarding. When you identify someone who might not have been the best fit, pinpoint the exact problem the employee is having. This is a great opportunity to look at internal mobility for the individual. While they might not be a good fit for the current team they are in, they might be a perfect fit for another position on another team. Be open with the employee about the issues you’re seeing and the options they have available within the organization. In most cases, a bad fit can be felt on both sides. Hiring a bad fit at the manager level can lead to a multitude of issues within an organization. In fact, according to a Gallup study, half of all employees have left a company to get away from an ineffective or disagreeable manager at some point in their career. More often than not, this happens because the manager is a bad fit, not because of personal disagreements. When you hire a bad manager — and Gallup says that happens as often as 82% of the time — that manager is also more likely to make bad hiring decisions themselves, only compounding the issue. Hiring a good fit at the management level is vital for the success of the team as well as the organization as a whole. A manager who is a good fit will be able to better manage their team and foster better engagement and productivity. 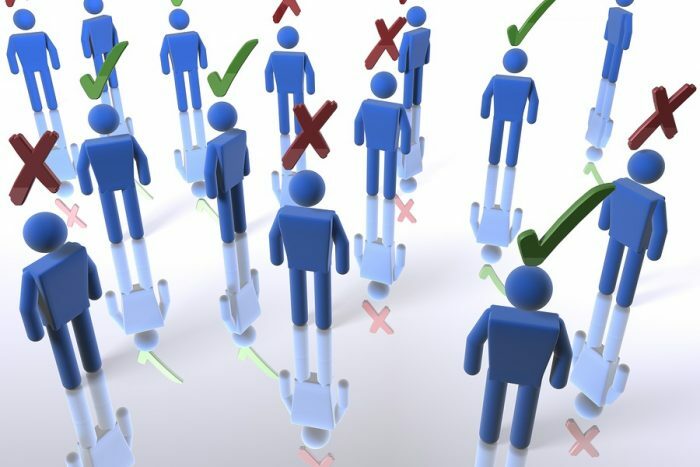 Solutions like Humantelligence equip organization with the ability to assess a candidate’s fit with the organization as well as the team they will be managing. Kellie Brown is the marketing manager at Humantelligence. She is responsible for spearheading Humantelligence’s digital marketing, demand generation, and events efforts. Kellie has built her career upon her passion for the intersection of analytics and creativity that marketing provides. She has extensive experience strategizing and executing demand generation, engagement and awareness programs for human resources and assessment software. When she’s not strategizing, she’s researching and writing about the latest in HR and recruiting technology. Kellie holds a Bachelor of Arts degree in Communication Studies from California Polytechnic State University, San Luis Obispo where she studied marketing, advertising and communication theory. She has worked under the marketing function in business consulting, creative advertising agencies, and cloud-based software organizations.